Energizing Urban Ecosystems is a Finnish 4-year research program for 2012-2015, with 20 million € funding from industry and public bodies including Tekes, The City of Espoo, and Aalto University. The EUE program has brought together a broad group of researchers, innovators, business interests and civil sector participants to pursue its ambitious objectives. The program is organised through RYM SHOK, the Strategic Centre for Science, Technology and Innovation for the Built Environment. 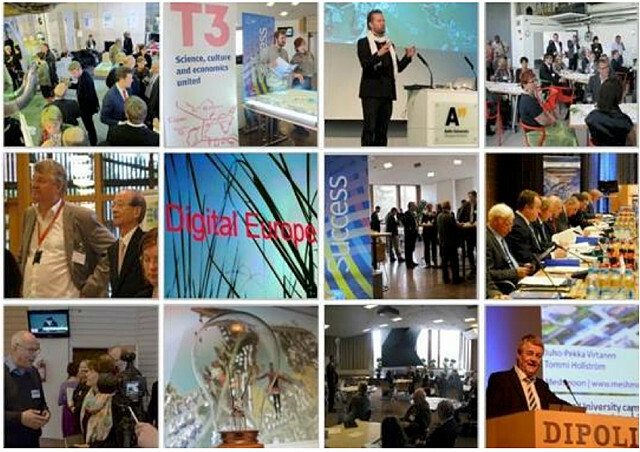 The EUE research case is the T3 area in Espoo, Finland’s most significant concentration of innovation activity and an ideal landscape for prototyping potentially valuable innovation methodologies and technologies in real-life test beds. The program will create an internationally recognized and multidisciplinary hub of excellence for urban development in Finland, working through a globally networked cooperation platform for R&D projects in urban development. The core strategy of the Energizing Urban Ecosystems (EUE) programme of the Strategic Centre for Science, Technology and Innovation for the built environment is crystallised by one of its objectives: to generate, in a centralised manner, world-class expertise concerning the entire lifespan of the built environment through multi-sectoral and multidisciplinary top-level research. The idea of genuine cooperation between several different actors in the field of the built environment in matters related to regional planning and development has produced new cooperation methods that share the common denominator of a specific area. A common goal is to create a multidisciplinary cluster of top-level expertise in the field of urban planning and visualization development for Finland. From an international vantage point, the region in question equals the Helsinki Metropolitan Area. For the moment, few cooperation partners are familiar enough with Finland to merit discussion of an international innovation cluster. This research lead by Tommi Hollström Adminotech Ltd focuses especially on creating a new working culture for virtual worlds: a realXtend based social media and virtual reality platform and 3D virtual software applications. Within the EUE program, the Regional Innovation Ecosystem (RIE) work package has brought together diverse technologies and methodologies for new urban design and development. In this innovation- enabling environment, the EUE program demonstrates how to effectively implement the key enabling success factors of the Europe 2020 strategy, and how an updated triple helix model supported by the Knowledge Triangle approach can enhance collaboration between the city, universities, research institutes and diverse enterprises throughout this regional innovation ecosystem. The EUE program was has moved forward in a number of ways, including its scientific research on regional information modeling integrated with virtual reality applications. The EUE research program is using cutting-edge techniques for spatial data acquisition. Regional information modeling allows for the broad utilization of expertise by combining the digital and the physical world. The starting point for regional information modeling is an existing map, building and geographic information together with modern measuring technology, environmental and building models, and virtual elements. Defining the content and structure of the model creates a foundation for future applications that may focus on topics such as information retrieval, the use of services, mobility or, in general anything that a resident or a visitor to the area or a person operating in the area may need in his or her daily life. “Committee of the Regions (CoR) points out that management of the built environment and urban planning are sectors with a high impact on the local economy as well as on the quality of the living environment… “ – opinion of the Committee of the Regions on the DIGITAL AGENDA FOR EUROPE, approved by the CoR Plenary on 6 October 2010.